Two major sculptures of the ancient Athenian Acropolis have been reprised in many places and at many times since antiquity. 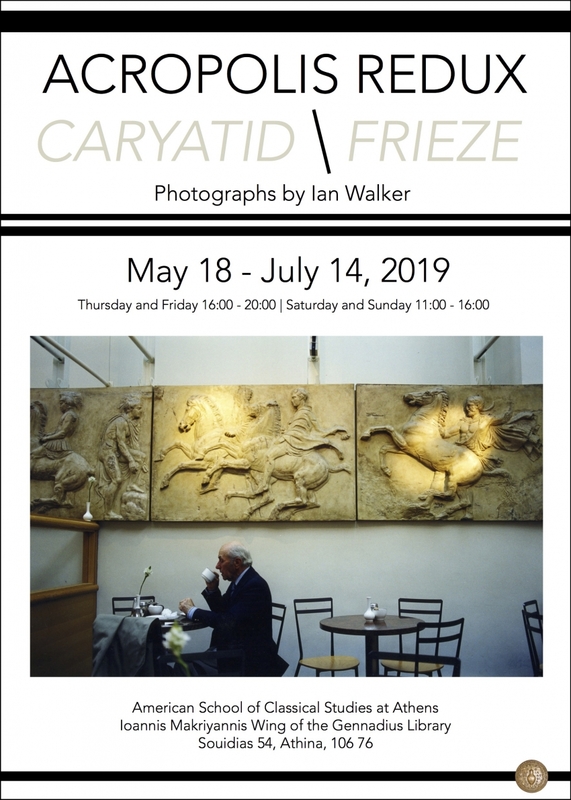 The British photographer Ian Walker has captured in film the enduring presence of the Erechtheum’s Caryatid and the Parthenon’s frieze in various guises from London housing projects to a Cleveland mansion. This exhibition presents two groups of photographs which share a common theme – how the sculptures which adorned the temples on the Acropolis in the 5th century BC were disseminated in the modern world and became models for western art. Caryatid focuses on the standing female figure taken from the Erechtheum by Lord Elgin and now housed in the British Museum which inspired neo-classical caryatids created in London. Frieze highlights the many casts that have been made of the 524-foot relief that once surrounded the Parthenon. Grand and public, or discreet and private these photographs have been gathered from across Britain, Europe and the USA. Accompanying the photographs are illustrated books and small works of art that have been inspired by the monuments of the Acropolis. The show will open on International Museum Day, May 18, 2019 and will run until July 14, 2019 with a special reception on June 7, 2019 during the Athens Photo Festival.